Meet “The D Squad”, a foursome of fifth graders at the Grand Canyon School made up of a geek, a class clown, a teacher’s pet, and a slacker. They are bound together by one very big secret: the homework machine. Because the machine, code-named “Belch”, is doing their homework for them, they start spending a lot of time together, attracting a lot of attention. And attention is exactly what you don’t want when you are keeping a secret. Before long, things start to get out of control, and Belch becomes much more powerful than they ever imagined. Now the kids are in a race against their own creation, and the loser could end up in jail…or worse! 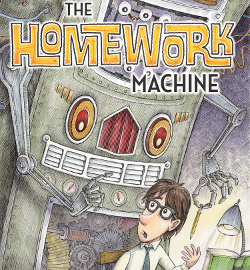 Co-written with Keith Herrmann (Romance/Romance), The Homework Machine received a sold-out world premiere production run at the Boston Children’s Theatre. Watch this website for future production details. What is cool? What is not? What makes someone or something “cool”? Celebrating differences among people and not pre-judging. There are consequences to taking a shortcut instead of doing it the right way…of making the wrong choice.